Order the uncut British Blu-ray. At its core, The Raid 2 is quite an oldschool film. As its Welsh director Gareth Evans explains in the "making of" featurette on the Blu-ray, he is an admirer of the works of John Woo and other colleagues, who back then orchestrated their action scenes in a way that actually showed the audience what was happening. The camera filmed the events way different than today, where a large part is played out in the viewer's head, stimulated by loud sound effects and fast editing that often lead up to the conclusion: we didn't see anything, really. To demonstratively do the opposite thing has been the trump card that made The Raid: Redemption so special in this day and age and it explains why it is so euphorically celebrated. The merciless consequence that fuels the camera work impressed film fans who started to fear that they'd have to grab some old classic from their collection when they wanted to avoid the flashy, modern shaky cam orgies of recent mainstream action. Even more astounding is the fact that The Raid: Redemption was rather born out of necessity because for years director Evans couldn't manage to secure the financing for the rather expensive Berandal, which later turned into The Raid 2. Instead, he had to concentrate on a prologue story that could be done on a smaller budget thanks to a limited location and also function as a showcase of his talents. But apart from all the praise that the first film got, it should be mentioned that the story wasn't much more than functional, especially considering the scrapped plans for Berandal. The numerous fights didn't require a well thought out narrative structure. So when there's a cause for criticism, it's this. And if you keep that in mind, the qualitative increase that The Raid 2 is introducing doesn't hardly surprise. Instead of delivering a simple copy with more carnage but less individuality, as it is sadly often the case in the sequel business, the second movie embodies a larger continuation of the basics introduced in the first film but differs in terms of visuals and style of narration. And this is one of the advantages that Evans had to put his Berandal plans on hold for so long since he had time to sharpen his vision, making it all but a quick shot to monetize the hype at the box office. The choreographies are breathtaking, the imagery is decidedly more variable thanks to numerous locations and the level of violence has been raised, as well. With a runtime of 150 minutes, the film does ask patience of its audience but rewards it often enough over the course of events. It's almost a shame that Evans wants to do something different for a few years before taking on The Raid 3. Since action fans will most likely be served with the US remake of the first film under direction of Expendables 3 director Patrick Hughes, it will be highly interesting to see how that performs. 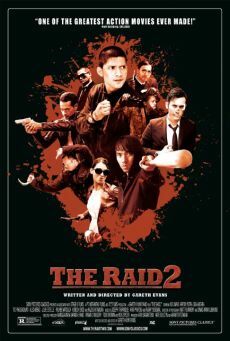 Will it be positively seen as a way to shorten the waiting for the third movie or will it fail so hard that fans become even more desperate for The Raid 3? We will be there to observe it, that's for sure. After The Raid got its "R" rating only after the MPAA got its 2 demanded cuts, it's just a matter of consequence that the sequel had to face a similar fate. Even before it hit US cinemas, Gareth Evans admitted via Twitter that cuts had to be made, although he was very happy with the amount of the alterations that only affected frames. In general, you'd be wise to take such descriptions with a grain of salt when they come from an involved person but Evans' statement turned out to be pretty accurate. Looking at the number of instances where cuts have been made, it has significantly increased in comparison to the first film. However, oftentimes they are so minimal that you'd probably not be able to notice them if you were to watch the rated version. The motto here was clearly reduction instead of removal and the cutting of just a few frames here and there can sometimes only be called "cosmetics". Many brutal scenes stayed completely intact and didn't lose their general impact. Still, as a film fan you don't want to be affected by censorship. And here, the US-based fans weren't all too fortunate. The MPAA cuts didn't only affect the theatrical release of the film but resurfaced on the DVD and Blu-ray, as well. That is surprising when you consider that the release of the first film was handled differently. Other markets could rejoice, though, since distributors got the fully uncut version for both cinemas and home video releases (e.g. the UK, Germany and surely many others). An import of the uncut version seems to be a viable option here. Comparison between the R-Rated (included on the US DVD/Blu-ray by Sony Pictures) and the uncensored original version (included on the British BBFC 18 Blu-ray by Entertainment One). 0:05:19: The shooting of Lieutenant Wahyu is very bloody in general but the R-Rated is missing a frontal view showing him being hit by even more bullets. 1:11:00: As Uco pulls the knife out of the throat, the R-Rated doesn't show it. 1:21:17: Prakoso stabs the guy's throat 3 more times with the broken bottle. 1:32:39: The R-Rated shows how the hammer is stuck in the bodyguard's chin but cuts away as the camera moves forward and focuses on the next opponent that approaches. 1:32:46: Just a few frames longer as the hammer is stuck in the wound. 1:34:11: And again as the skull gets spiked up by the hammer. 1:34:20: That's barely noticeable. As Hammer Girl sinks her tool into her opponent's back and blood spurts out, 5 frames were cut. 1:47:08: The slow-mo headshot misses 4 frames. 2:19:22: A little longer as Rama holds the knife in the assassin's throat.